This patient came in the other day and needed some work. It has a cluster with two pull chain sockets. The sockets were not working at all. One can come loose from the socket cap. Upon further inspection, we notice the lamps plug is not polarized and the socket insulators are brittle. So the lamp parts we needed are two pull chain Fat Boy socket interiors, two Fat Boy socket insulators, some lead wire, wire nuts, and a snap on polarized plug. First the cluster cap is removed and the wires are pulled out. These wires are old and really stiff. A pair of pliers is needed to pull the wires out of place. The socket interiors can now be removed from from the cluster body. The new sockets are wired with white and black leads. The new socket interiors have bright shiny pull chains and do not match anything else on this lamp. For a finished look, the old pull chains are removed from the old socket interiors and attached to the new socket interiors. The old socket was enclosed so a single screw removed and the socket opens up. These sockets are Fat Boy sockets: they have a larger flared base near the socket cap. The insulators are a little tricky so the best thing is to push them in with the help of a table top of table edge. Since the terminals on these interiors are on the bottom, it is important to inspect the insulators in the socket cap. These sockets are ready to be placed in the lamp. With the lead wires in the cluster, the wires are clipped even. Wire nuts are used to connect the lead wires to the lamp cord. The black wires connect to the smooth wire and the white wires connect to the ribbed wires. The lead wires in the cluster are trimmed and the lamp wire is stripped. A UL knot is tied in the cord. The wires are stuffed into the cluster and the slack is pulled through the lamp body. The cluster cap is placed back on the cluster. 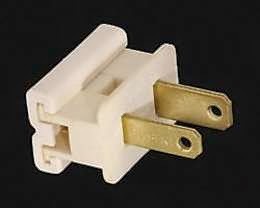 The old lamp cord was not polarized so it is getting replaced with a polarized snap on plug. This cord was extra thick so we used a plug for an SPT-2 cord. The important thing is to line the cord up right in the plug: the smooth cord goes on the small prong and the ribbed cord goes on the wide prong. This lamp is ready to be lit. Bulbs are added and the plug is plugged in.